The village tanyards lay to the south of the church. They're long gone but the occupation name lingers on in this field, together with its pond at the end of Cagefoot Lane - a piece of countryside in the heart of the village. 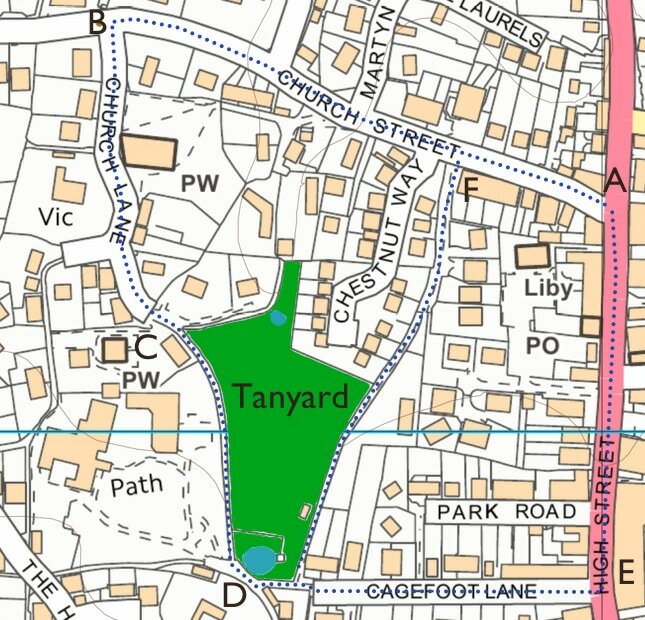 In the map below, the green area is the Tanyard Field, with the Tanyard Pond at its south point (D). There are two pleasant walks - routes marked ........ - round the Tanyard, both starting from the junction of the High Street and Church Street (A). Walk 1: Walk west along Church Street until you come to Church Lane on your left (B). Turn left and walk down Church Lane past Hacketts Cottage, St. Peter's Church and Old Tudor Cottage until you get to the end of the lane, near Corpus Christi, the Catholic church (C). From here, a path runs down the west side of the Tanyard to the pond (D), turns left and joins up with Cagefoot Lane. Walk east along Cagefoot Lane until you rejoin the High Street (E). Walk 2: Start at Church Street again (A) but this time, when you get to the pond (D), turn sharp left before joining Cagefoot Lane. This takes you on another path skirting the east side of the Tanyard, past the backs of the houses in Chestnut Way, becomes Craggits Lane and then rejoins Church Street by a row houses called Croft Villas (F). Tanyard field: A view across the field from the end of Cagefoot Lane. The white house in the distance on the right of the photo is Martyn Lodge. Tanyard pond: This pond stands in the south part of the Tanyard field, at the junction of Cagefoot Lane and the footpath which runs from Cagefoot Lane to the Tanyard. The pond was heavily clogged with algae some years ago, and was in a sorry state - the surface looked like a solid piece of green board. The Parish Council collaborated with the Sussex Wildlife Trust (based at Woods Mill) to clean it up. Tanyard field: An old black & white photo of unknown date, looking across the field from the side of the pond across to St. Peter's church. The smallholding to the right of the picture was managed by Bill Goacher. Tanyard from Chestnut End: A 2015 photo taken from the very end of Chestnut Way - called appropriately enough - Chestnut End, which shows the extent of the field. You can just make out the chimney of Potwell through the trees, in the far distance to the left of the photograph. Tanyard pond: A photo from late April 2016, with spring flowers out and spring blossom emerging. Tanyard field 1: Late April 2016, showing Chestnut End in the background and the spring greenery. Tanyard field 2: Also late April 2016, looking more towards the pond end of the field. Tanyard field 1: A photo from August 2016. Tanyard field 2 & 3: A photo from mid-October 2016, showing the field grass cut and baled. Tanyard pond: Also from mid-October, showing the pond in autumn colours. Tanyard hut: A photo of the hut by the pond - September 2016 - once the province of well-known Henfielder Bill Goacher. Tanyard field: A photo of the field showing the pond in the middle of the field, and Chestnut end, in March 2017. Tanyard field pond: A close-up of the field pond, with Chestnut End houses in the background, also in March 2017. Tanyard field interior: Each year, during the Henfield Gardens & Arts Festival in the second weekend in July, a path is mowed in the Tanyard field, and the gate opened to allow access to the interior. This picture and the one below were taken just after the Festival, in mid-June 2018. Pond in Tanyard field: The pond in the middle of the field can be seen from the footpaths that run east and west of the field, but this is a close-up, taken from the interior. The algae is cleared at intervals. Tanyard field & pond: A photo from mid-June 2018 showing the field, the pond with water lilies - and a Wild Violets legs & flowers creation sitting on the bench. Water lilies, Tanyard pond: A close-up of the water lilies in the pond, summer 2018. Tanyard pond: This view from 2007 shows the pond before it was cleared of weed, which was so thick that it was covered in dirt and almost like a solid surface.